An incredible THANK YOU to Michigan State University Federal Credit Union for selecting CASA as one of their Charities of the Year!! We are amazed by the financial and volunteer support from MSUFCU, and very grateful for their commitment to support advocacy for children who are experiencing abuse and neglect! Their engagement and support for the needs within the community and passion to get involved has been a wonderful blessing for CASA! Thank you to Mercantile Bank for raising support for CASA's mission within your branch! We appreciate you! A very special THANK YOU to Jackson National Life Insurance Company IT Department for awarding CASA $13,320 from their 2018 Jackson IT Charity Classic Golf Outing. CASA is very grateful for Jackson National's commitment to CASA's mission and the most vulnerable children of the community. This funding will be a significant help as CASA expands services to the children in Ingham County. Thank you Jackson!! 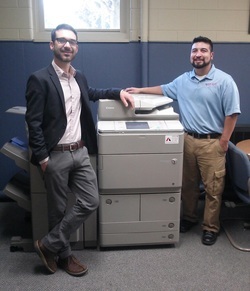 An INCREDIBLE THANK YOU to Applied Imaging - who in collaboration with the Grand Rapids Public Schools donated two large copy machines and two desk top copy machines valued at $6000 to the Hastings and Charlotte CASA Offices! This donation is a huge blessing to the organization and will provide significant cost savings to the organization throughout the year! We are very grateful for their generosity and their wonderful staff!